Race Trophy awarded by OSRAM to the winning driver in the BARC Saloon Car Race Competition. The racing driver Hammond Innes presented the Trophy at a splendid event in the Grosvenor House Hotel. 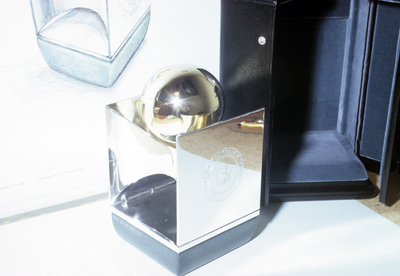 The Trophy: (silver, supporting a silver-gilt and subtlely ovoid form and with a Base of Cumberland Green Slate (engraved by George Lukes). 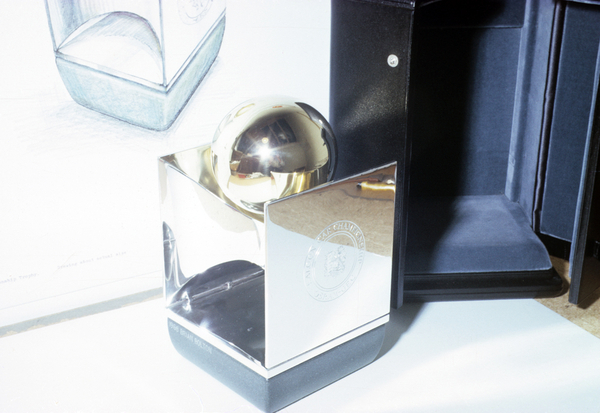 Although originally made for The National Saloon Car Racing Championships, a few years later, the above Trophy was re-named by Osram-GEC Ltd. and then served as the Lighting Efficiency Trophy for The Lighting Industries Federation. Simplified, small keepsakes were also presented annually for several years.